Lots of titans clash in their wrath pretty darn epically in this sequel to a remake. Wrath of the Titans is pretty much a glorious promotion for the wonders of IMAX 3D. The movie follows Perseus, you know, demi-god son of Zeus and all that jazz from the first movie, the remake of Clash of the Titans. Now after his epic battle and defeat of the Kraken he’s settling down as a regular village fisherman raising his son. Clearly he gets called back in to help defeat some more evil doers by Zeus or else watching Sam Worthington as Perseus being a fatherly fisherman would make for a very lame movie. Actually, the movie itself is pretty lame anyway. It employs all of the regular, normal, been-there-seen-that action movie tropes. The only thing that makes this movie tolerable is actually the absolutely mind-blowing special effects. Yes, this movie has Cyclops’. They’re super goofy looking, giant humanoids which look stunningly real. The extreme amount of detail put into the creation of these creatures is very evident. From the stubble on the Cyclops faces, hair on their legs and chest that move in the wind, to the detail in their extremities (tendons, veins, and even nails have all very authentic looking textures), the reality of these creatures could easily be questioned from myth. It’s totally possible for 50 foot creatures to just be wandering through forests for millennia with nobody discovering them, right? If you’re claustrophobic, you may need to close your eyes. There are a few scenes where the IMAX 3D was utilized to its greatest effect, that being the feeling that one is moving through tunnels and crevices as the camera swooshes through them. However, the tight spaces can create a bit of claustrophobia for those sensitive to tight spots. The effect is extremely real and incredibly awesome. Finally, a 3D movie that uses 3D properly. The depth created is what 3D movie’s, I feel, are made for. Sure it’s cool when stuff seems to be popping out of the screen, but it’s also pretty neat to feel immersed in the movie in the sense you can get a greater sense of depth and distance between the characters and the objects/walls in the scenes. It creates a sense of immersion you can’t feel with regular 2D movies. That’s enough of the effects, what about the actual movie? Yeah…what about the actual movie? It’s honestly just awful. The story is dull and the characters are just shells of people. I would assume demi-gods, being half-human, would contain at least some humanity. Yeah, Perseus is a father and stuff, but his affection for his son is just so on the surface you wonder if there are any depths to these people. There’s the comic relief in the character of “The Navigator” and of course the eye candy is given to us by the lovely warrior Andromeda (Rosamund Pike-who was in the spectacular drama Barney’s Version as a charming, strong female character). I guess Wrath of the Titans at least tries to portray Andromeda as a powerful female figure, but then it’s instantly undermined by her flawless appearance (even in battle!) and the kiss Perseus pretty much forces on her at the end of the movie, which is just ridiculous. Nothing says female power like a man taking the choice out of an intimate act. There’s always a massive epic showdown to finish off action movies, this is no exception. It is, however, so extraordinarily badass! The giant god-created monster at the end is just so cool! I really can’t say anything else but that. The battle is great- predictable- but fantastic. There’s a giant, fiery rock beast that hurls flaming boulders at the warriors below! Again, it’s all the work of the special effects that make it amazing. Overall this movie was honestly pretty average. The characters and story are boring and predictable but the special effects are what make this movie an entertainment must-see. However, you must only see it in IMAX 3D. 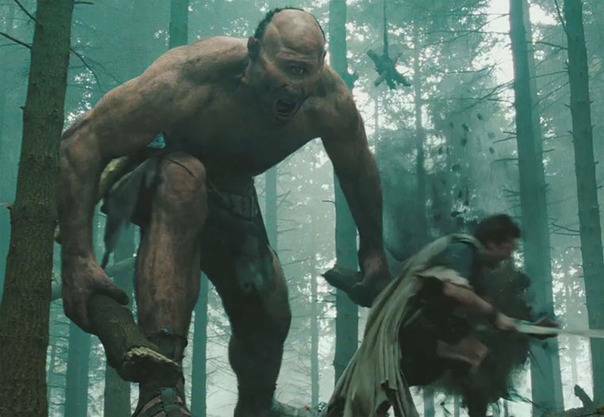 If you don’t, Wrath of the Titans would only be a colossal waste of a precious 99 minutes out of your day. There are currently No Comments on Movie Review: “Wrath of the Titans”. Perhaps you would like to add one of your own?